If you remember our Arduino Lessons, you will recall that we could write analog voltages to the output pins with the ~ beside them. The truth is, though, we were not really writing analog voltages, we were just simulating analog voltages using pulse width modulation (PWM). The arduino was able to put out 5 volts. Hence, if you want to simulate a 2.5 volt signal, you could turn the pin on and off every quickly, timing things such that the pin was on half the time and off half the time. Similarly, if you wanted to simulate a 1 volt analog out, you would time things so that the 5 volt signal was on 20% of the time. For many applications, such as controlling LED brightness, this approach works very well. Arduino made it easy and transparent to the user to generate these analog-like output voltages using the analogWrite command. Note on the Raspberry Pi, the output voltage is 3.3 volts as opposed to the 5 volt output on the Arduino. Hence, the Raspberry Pi can only simulate analog voltages between 0 and 3.3 volts. For this example, we will be playing with the following circuit again. Note we are using physical pin 9 as the ground and physical pin 11 as the power pin. 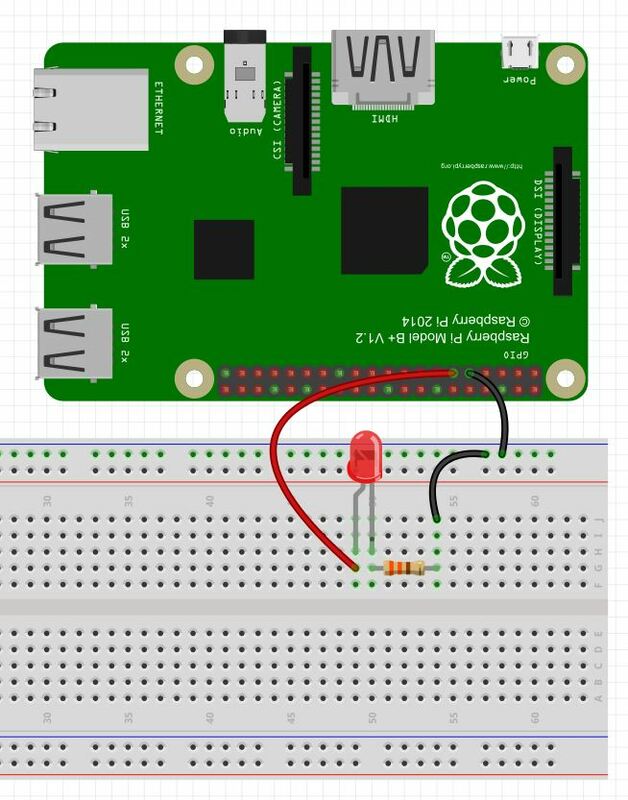 See Lesson 25 below for a diagram of pin numbers on the Raspberry Pi. Note, if you prefer the BCM system, replace BOARD with BCM in the command above. When you type this command you should see the LED come on, if you have connected things correctly. It should be at about half brightness. Again, please remember that the capitalization has to be exact. Now you can get any brightness you want by changing the duty cycle to anything between 0 and 100, inclusive. Note that by doing this there is no perceptible change in LED brightness because you have not changed the relative on and off time of the signal. You are just going faster, but not impacting the fractional time the signal is on and off, hence the LED brightness does not change. While in these examples we have done things from the control line, you can write python programs that will run the commands for you. For example, write a program that asks the user how bright he wants the LED, between 0 and 100, and then set it to that brightness by adjusting the Duty Cycle, as we did in the example above. Play around with different pins and different frequencies and values. Become familiar with these commands. Thanks for the information. I was looking how to use PWM with GPIO but could never find it. Later I installed wiringpi library in Raspberry for PWM. Now I know how to use GPIO for PWM. Later I will try this out. You used Pin 11 for PWM. What are the other pins that could be used for PWM. Any limitations on which pin can be used and how many pins can be used for PWM? Wondering what the frequency range is for the PWM does it go above 1000Hz? if so how much? Recent comments on other sites suggest upwards of 30MHz, depends on your PWM step resolution/library though. Just toggling a pin as fast as possible, 70KHz pi/95KHz pi2 from python. C native library ran the fastest at 22MHz pi/100+MHz pi2. I want to get analog sine signal of 7MHz to 15MHz. Is it possible to make such analog signal from Raspberry Pi directly ? In raspi-config there is an Enable GPIO button where the SSH enable is. Does this have anything to do with how the GPIO system works? Why is it there since we didn’t use it for these lessons?